Sharks fans in Oil country. Today is one of the most underrated holidays of the year. During the All-Star Game Media Day, some of the most notable NHL players gave fans an inside scoop (slice?) on how they best prefer their ‘za, so it doesn’t surprise us that some players took today as an excuse to chow down on one of their favourite cheat meals. (We’re not sure if there’s a correlation between Russian-born players and not liking pizza, but that’s a different tale entirely). One of the NHL players that took today as an opportunity to enjoy some pizza was the San Jose Sharks Evander Kane. When he got his order, though, it was, indeed, a very special delivery. 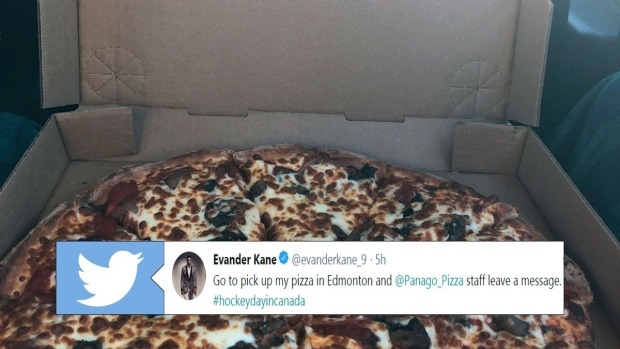 While many players enjoy chicken and rice pre-game, Kane elected to enjoy some Panago Pizza before facing off against Edmonton, and exposed a secret Sharks fan in Oil country. We’re not sure who was behind this message to Kane, but we feel like it could be the same person that threw his Oilers jersey on the ice fairly recently. Whatever the case, this fan turned pizza delivery man will see if his pizza serves as good fuel when the Oilers host the Sharks tonight.